Patrick Purcell, Jeff Berkwits, James Roth, Gerry Williams, John Stone, and Dave Rankin attended this month's meeting. James, a retired Mars cartographer, began the meeting with a short and interesting briefing on the upcoming robot landings on Mars. He brought photos and maps of the landing areas and also used the Mars globe to illustrate his presentation. Beagle 2 is scheduled to land on December 25, 2003. America's Spirit and Opportunity will be landing on January 4 and 25, 2004, respectively. Beagle will be landing near Sytris Major, Isidis Planitia. Spirit will be landing at Gusev Crater adn Opportunity at Meridiani Planum. More Information for Spirit and Opportunity can be found here. There was a moment of silence for the Japanese Mars probe Nozomi, which was abandoned just days before reaching Mars. Political Lobbying: Gerry met with local congressmember Bob Filner on December 11th. He discussed the Mars Society and its proposal for focusing the US space program on sending humans to Mars. He tied this in to the current review of and Bush's pending decision on the future of the space program. The SDAA's "STARS IN THE PARK" telescope event was a low key affair this month. The fog rolled in by 9pm, so we broke down the table early. Fewer people showed up that night as well. TMS-SD MARS MOVIE NIGHT last month was "STRANDED". It was uniformly praised as being the best, or the "least bad", of all the Mars Mission movies that came out in the past few years. Gerry will be encoring the movie again in the very near future for those who missed it the first time. We also discussed scheduling some Mars documentaries in the near future. Mission Support: Satuday, December 20th we start our third season as Mission Support for MDRS . We will support the first two crews at MDRS. The mission will last one month. Gerry will be the Mission Support Director for the first two weeks (Crew 20) and Dave will follow for the next two weeks (Crew 21). Our own Shannon Rupert Robles will be at MDRS as Mission Commander during Crew 21. We will fill the usual positions again this year: Mission Director, CapCOM, Engineering Officer, Journalist, and Observers -- the Science Officer position has been claimed for the entire season by Shannon's "Back Room" group. We may change the Journalist position to doing a weekly feature-type report rather than a daily recap. We will tie the mission support to the Mars robot landings in our pubic relations effort. Anybody who wishes to volunteer for mission support should contact Gerry Williams or Dave Rankin. The MDRS Mission Support Sign-Up can be done online. Chapters Challenge: We presently have 57 points and lead Los Angeles, who has 27 points, and NorCal, who has 7. Neither of the other chapters have reported points recently, however, so the points totals are deceptive. Mars Suit Task Force: Gerry reported that Tim Sommer continues to work on the suit project. Mars Rover Model: Patrick brought the rover chassis and also the solar panel for the rover that he built. Gerry brought the camera that he purchased for the rover. We hooked the camera into the TV to see how it looked on camera. It looked very realistic. Patrick took the camera with him to install on the rover. We hope to use the rover in our PR efforts next month. New Display Board, Flyer, and Website: Gerry continues to work on these three projects. The new display and the new flyer will be ready by the first of next month. Dave will be featured on the radio in Washington state on Friday, December 19th. He will be the guest on Ken Johanssen's Two o'Clock Show on KPQ 560 AM News-Talk Radio for 20 to 30 minutes starting at 2:00 pm. You can listen live online. Friday, December 19th is the next MARS MOVIE NIGHT. We will be showing Lloyd Bridges stars in "ROCKETSHIP X-M" (1950) at 7pm at Gerry's Studio 106. We will be at Balboa Park during the evening for "STARS IN THE PARK" on Wednesday, January 7th. 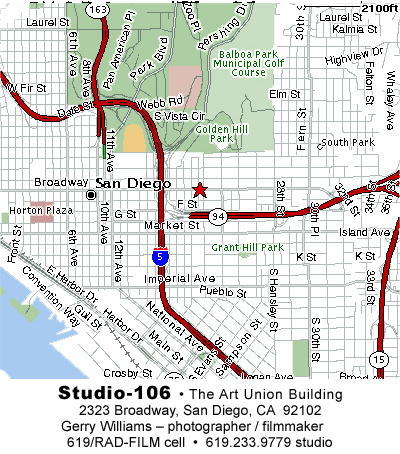 The next REGULAR MONTHLY MEETING of TMS-SD is Friday, December 9th at 7pm at Gerry's Studio 106. TMS-SD Anniversary Dinner -- The Mars Society's San Diego chapter celebrates its third anniversary this February. Chapter members at the meeting tentatively decided on Sunday, February 8th or on Sunday, the 29th for the annual dinner. The preferred location is Killer Pizza from Mars in Oceanside or Escondido. Patrick agreed to look at the Oceanside restaurant to see if it would be a good location for the party. We celebrated Yuri's Night World Space Party at the Escondido restaurant earlier this year.